A report on Tuesday puts a date to rumors regarding an impending Mac hardware refresh, saying Apple will announce all new computer models at an Oct. 27 media event. Screen sizes of 13" & 15"
Citing sources familiar with Apple's plans, Re/code reports the company intends to refresh its Mac computer lineup at an as-yet-unannounced special event "at or near" Apple's headquarters in Cupertino, Calif. The report fails to mention specific models set for debut, but recent rumors point to the release of three laptops, including a revamped MacBook Pro. On Monday, a report citing Chinese supply chain sources said Apple would take the wraps off 13- and 15-inch MacBook Pro models and a new 13-inch MacBook Air iteration by the end of October. Those claims were reiterated in a separate report earlier today, which noted the 11-inch MacBook Air would be left without an update. While Apple's upgrade path for the MacBook Air series is unclear, rumors suggest the Pro models will benefit from a new OLED "Control Strip" set to replace the laptop's top row of function keys. Well-connected analyst Ming-Chi Kuo first brought word of OLED touch bar integration in a note to investors in May, saying the component will display app-specific contextual commands and common system controls. 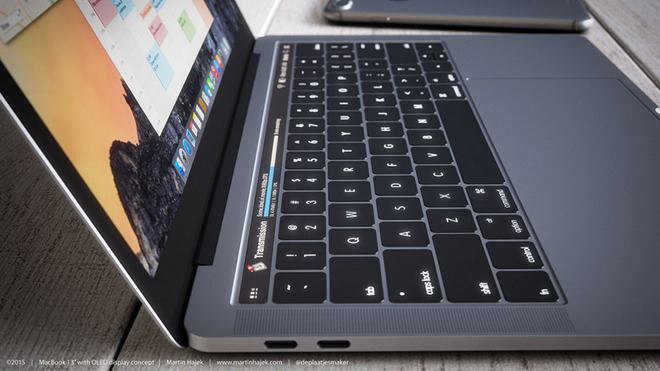 Apple is also rumored to incorporate Touch ID technology into its upcoming MacBook Pro lineup. Though an exact implementation is unknown, it can be theorized that the fingerprint sensor will simplify security and enable Apple Pay, facilitated through macOS Sierra's support of the payments system. If Re/code's sources are correct, Apple's forthcoming Mac hardware release will arrive just in time for the lucrative holiday shopping season.